← Bow Wow Brunch Seattle! WagFest 2012!!! Canine Cavorting in Seattle This Sunday! If you’re looking for a way to assure your pooch that weekends are not for sleeping in and totally devoted to pleasing them – come to WagFest this Sunday, September 16th. * Small Dog races and….. The Great Tennis Ball Dive!!! 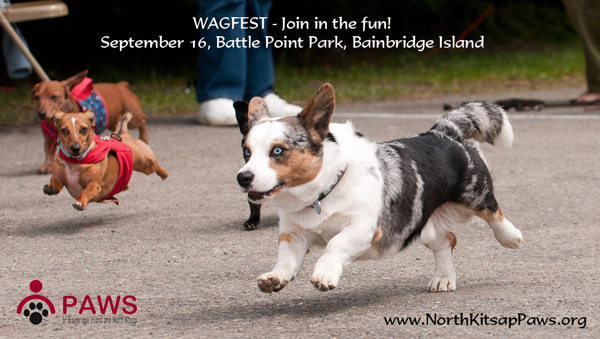 WagFest 2012 will take place on September 16th from 9-1PM at Battle Point Park on Bainbridge Island. For information visit the PAWS of Bainbridge Island & North Kitsap website. Ask family, co-workers, neighbors and friends to make an online or other donation to PAWS in support of you attending WagFest 2012. You can also make contributions at the registration table on the day of the event. Proceeds benefit the PAWS Community Programs, which include the PAWS PetFood Bank, Veterinary Financial Assistance, Low Cost Spay/Neuter, Kitsap Lost Pets and more.